Cochran also works on wood, metal and ceramic tile. Normally, his paintings are small and intimate-feeling. It may not be an accident that, in spirit and technique, they recall the strongly massed, broodingly romantic canvases of Albert Pinkham Ryder, who also painted faster-drying atop slower-drying layers so that an underlying application would pull an overlying one apart. In new paintings like Speckled Sheep (2006), made with oil glaze, gouache and dry pigment on gessoed board, or Elephant Eye (made with the same mediums on paper, 2006) the bubbles and puddles of pigment have dried in transparent splotches of color that give the works a dreamy, melancholy air. Birdhouse (2006), a postcard-size, mixed-medium painting on sandpaper, also reflects this mood. In it, a plain black hut appears directly in the foreground but also at a mysterious remove, as if seen through water, submerged at the bottom of a pool. The image emerges through a foam of turquoise, green and black. 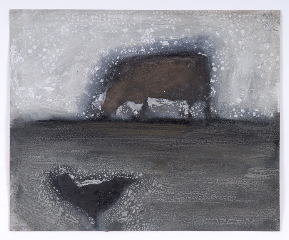 Recalling Susan Rothenberg’s emblematic horses, some of Cochran’s subjects are at once apparitions and solid entities, like the bird and beast in Brown Cow (2006), also on gessoed sandpaper. Cochran’s art is that of an inquisitive, restless experimenter who is in considerable command — and, unabashedly, in awe — of the expressive power of paint. For more information about any of Colin's paintings, please contact us.